TradeConnect is a multi-asset peer-to-peer blockchainbased exchange that will allow investors to trade a wide range of financial products such as cryptocurrencies, equities, FX, commodities and more. TradeConnect will disrupt a market that is dominated by banks, prime brokers and large funds, creating an immense opportunity to become the leading multi-asset blockchain-based trading network to trade a wide range of financial products not found on traditional crypto exchanges. 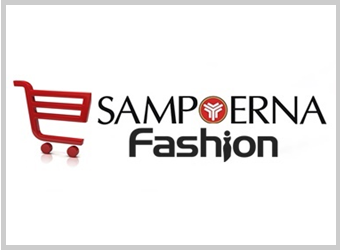 Initially focused on the retail trading sector, the network will then be expanded into the institutional and corporate derivative trading markets, and subsequently to a range of other financial sectors. Ultimately, the trading solution will enable a client to trade any financial product with any counterparty using the public blockchain – agnostic of platform or broker. The Value of the Foreign Exchange (FX) markets, stock, futures, commodities and OTC derivatives markets stood at over US$542 trillion in the six months to July 2017. The advent of the blockchain has created the first major opportunity to disrupt these markets since the introduction of electronic trading in the 1980s. TradeConnect’s primary goal is to become the world’s largest multi-asset blockchain-based trading network. In order to achieve this goal TradeConnect will create a trading economy with the ThinkCoin token (TCO) used as a means of payment to trade financial products, grow the liquidity pool in the network and scale transactions. TradeConnect Limited is a member of the ThinkMarkets group of companies. 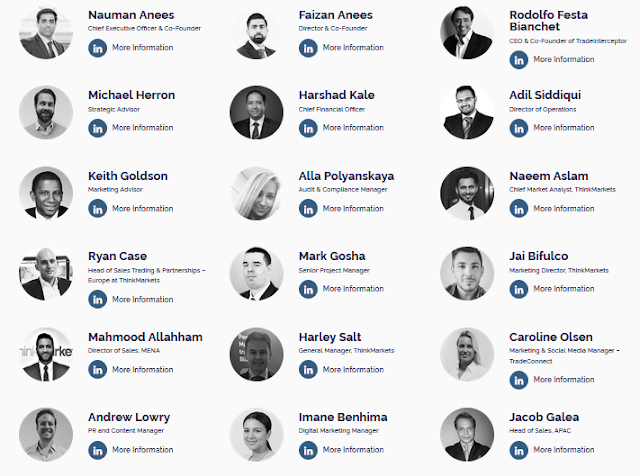 ThinkMarkets is a licensed financial services company in the UK and Australia which brings more than a decade of experience, a history of innovation and a strong portfolio of intellectual property to use on the TradeConnect network: all of which will allow it to exceed the goals outlined in our roadmap. Global financial markets are dominated by banks and other financial institutions, some of which lack transparency, have undue influence on global asset prices, and can impose unfair charges. We will create a cutting-edge new peer-to-peer multi-asset trading network that will disrupt and democratize trading. We are calling this network TradeConnect. This network will allow individuals and institutions to trade directly with one another on a balanced playing field with lower costs for all. Trades will be automatically settled on the blockchain, with recording and execution conducted off-chain to deliver the fastest service possible. To raise funds to design and develop the network, we are launching an ICO of ThinkCoin, a bespoke new digital token that will underpin trading on the network. The TradeConnect network is poised to bring significant and lasting change to the trading of financial products by creating the first true multi-asset blockchain based trading network connecting individuals, prime brokers, corporations and brokers on an even playing field. We will combine transactions made on and off the blockchain, which will allow us to settle contracts faster than conventional trading and benefit from the trust inherent in distributed ledger technology. Trading is currently conducted with little transparency, with large prime brokers, banks and institutions controlling the flow of information and maintaining full control over both the prices set and the settlement process. The time has come to change this by decentralizing and democratizing the world of trading with the TradeConnect network. 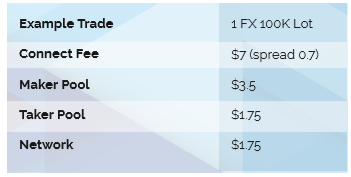 As part of the ThinkMarkets Group, we will start with what we know: derivative contracts in the CFD, Forex (FX), commodities, equities and cryptotrading markets. 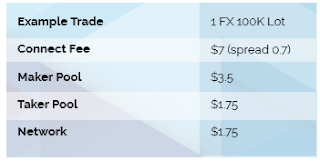 ThinkMarkets already provides these products to thousands of customers around the world as a regulated broker. Our knowledge and experience mean we are wellplaced to expand and extend the TradeConnect network, and to ultimately offer trading in other financial products to all participants. Derivative trading markets are mature, but new technology has revealed several areas where the status quo is failing. Trading is currently dominated by brokers and counterparties with whom individuals are obliged to open an account to start trading. Individuals cannot easily trade directly with one another, limiting the marketplace. TradeConnect will allow individuals to trade with each other, eliminating the need to use a broker. Peer-to-peer trading on the blockchain will transform the way individuals invest their money and trade. Clients are required to deposit their money with the broker and rely on them to hold it segregated from their own and in trust for the client. Such requirements vary by jurisdiction and many unregulated brokers do not provide adequate protection to their clients. 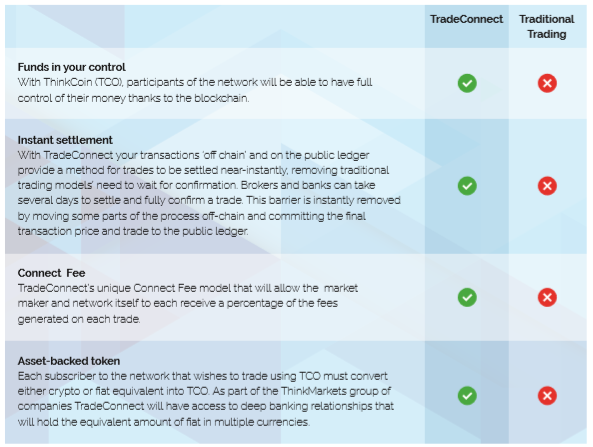 By using the TradeConnect network and with all assets verified on the blockchain using TCO, participants do not have to worry about settlement of funds and their money being sent to a broker. Settlement of trades can take time in the current model of investing and trading. There are many cases where financial institutions have collapsed when they were not able to settle their funds, and individuals have lost their money. 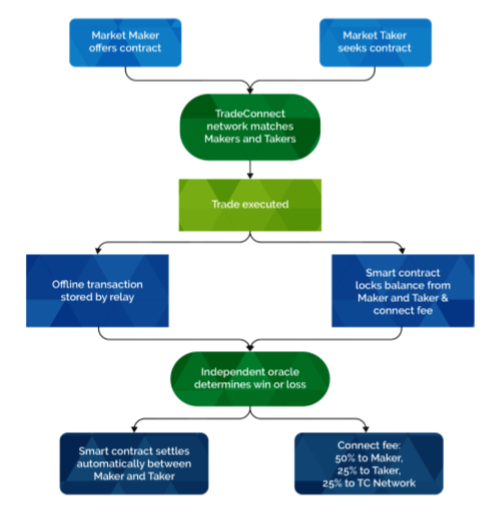 By conducting trades on the blockchain using the TradeConnect network with TCO as a method of settlement, this risk is substantially reduced. 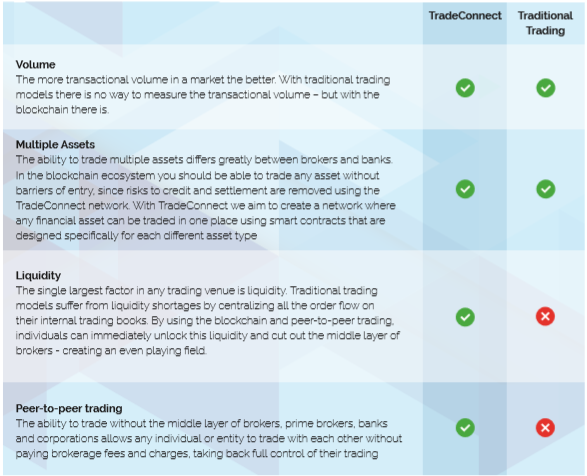 TradeConnect has a token economy that is marketneutral and, unlike other exchanges and principal market making brokers, is primarily based on transactional volume vs “risk taking”. The structure of the network will allow a diverse token economy based not just on commissions, but a variety of market-neutral models based on the growth in volume versus the market risk in the network. TradeConnect has decided to remove commissions altogether and will implement a Connect Fee paid in TCO that will fund the ongoing development and maintenance of the network as well as incentivize traders to participate in the TradeConnect economy. 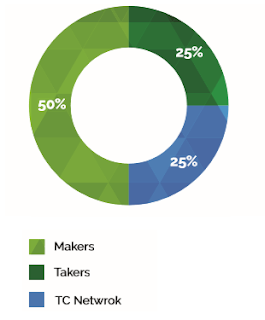 In contrast to traditional brokerages or exchanges which keep most — if not all — of the fees generated from trading activity, the TradeConnect network will rebate back 75% of all connect fees to active Makers and Takers on the network. Numbers Indicative of hypothetical spread. To ensure fair and transparent distribution, all fees will be divided into two daily pools (for Makers and Takers), then distributed at a specified time each day. Each participant’s daily allocation will be determined by the percentage of trading volume they completed that day relative to the total trading volume completed by all participants within in their pool. With the explosive growth of the blockchain sector, a new marketplace is developing for not only trading but listing and facilitating liquidity for ICOs and digital tokens. TradeConnect will capture a percentage of the total raise from new coins coming to market that wish to list and are approved on TradeConnect. The TradeConnect network will enable a range of different trading scenarios with various combinations of participants. TradeConnect’s algorithms will be able to match multiple traders to fill trades of larger size or lesser liquidity. Chen works for a brokerage firm which is a member of the TradeConnect network. The brokerage wishes to hedge some of its long exposure on Barclays Plc. 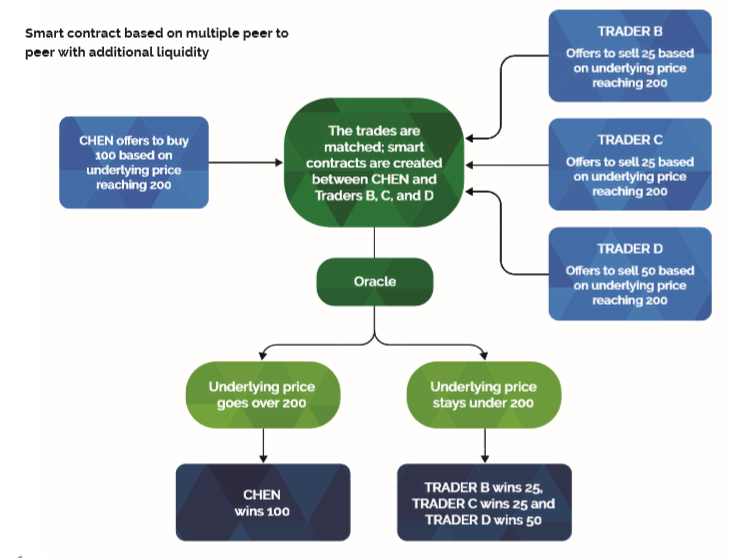 Rather than place a trade with a prime broker, Chen offers a trade to the TradeConnect network. He can then avoid the prime brokers fees and charges and as the Market Maker the brokerage will receive the Connect Fee rebate. Chen offers the market a long trade on Barclays with a size of $10,000 thus reducing their exposure. The network peer-to-peer matching algorithms match his trade with multiple Takers who wish to short the price of Barclays at the available price. On accepting the trade each of the Market Takers transfer their accepted trade size plus the Connect Fee. These sums are held by the network in a smart contract pending conclusion of the trade and settlement. As the price of Barclays increases the Market Takers lose their committed funds. The smart contract is settled automatically, and Chen’s brokerage is paid out. The Connect Fee is distributed between the Market Maker and TradeConnect, with TradeConnect’s share going towards the management and support of the network. 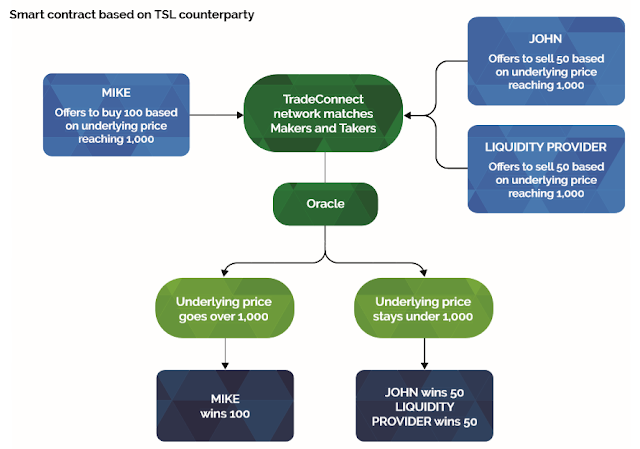 TradeConnect, ThinkMarkets or other brokers and counterparties can participate to provide liquidity to the network. At the network’s inception we anticipate that liquidity will need to be provided through principal trading but, as the number of participants increase, we will see more trades being matched between trading parties directly. Off-chain transactions introduce additional challenges. For instance, multiple users accepting the same offer could cause issues if users had to wait until on-chain verification for confirmation of a trade’s execution. System security relies on Trading contracts and Oracles. Trading contracts will be created using the best industry standards: open-source, recorded on the blockchain, audited by two external security auditors, and formally verified. Oracles will be trusted third parties. All transactions will be visible on the blockchain and therefore easy to audit. 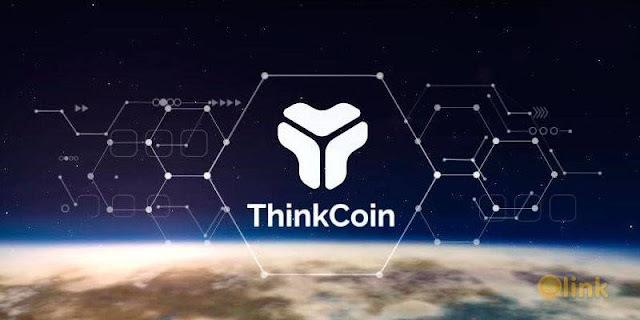 ThinkCoin tokens will power the trading environment as the unit of all trades on the TradeConnect network. Whether you trade Forex (FX), commodities, shares or other financial products, ThinkCoin will let you do it and in a simple, secure and user-friendly way. You can acquire TCO through our ICO or, once the ICO is finished, by exchanging fiat currency and other cryptocurrencies via numerous exchanges. 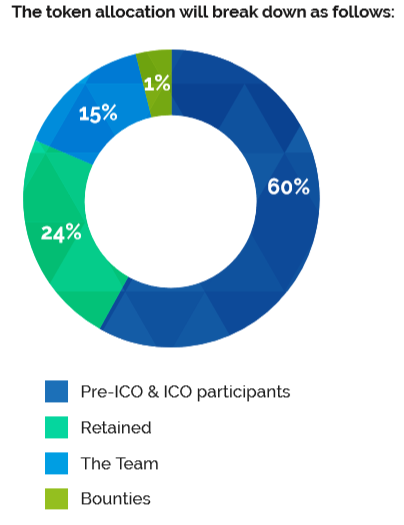 In addition to these stages of token issue, 1% will be retained to be used as bounties during the pre-ICO and ICO; 15% will be allocated to management, employees and advisors to reward and incentivise; and the final 24% will be retained for future use, such as a building liquidity pools for significant participants. 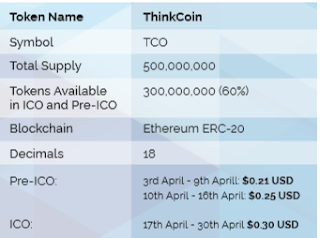 During the ICO - 17th April to 30th April – TCO tokens will be 0.30 USD each. The total number of tokens issued will be limited to 500,000,000. A total of 60% of available tokens will be issued (up to 300,000,000 TCO) during the offer period. In case not all 60% of TCO tokens available at the PreICO and ICO stages are sold, the remainder will be burnt in order to maintain the distribution as specified above. The Hard Cap for the Pre-Sale, Pre-ICO and ICO will be $30,000,000 USD. TradeConnect may offer additional token bonuses or discounts to Pre-ICO and ICO participants. These may include bonuses for significant investments or for support online and on social media. 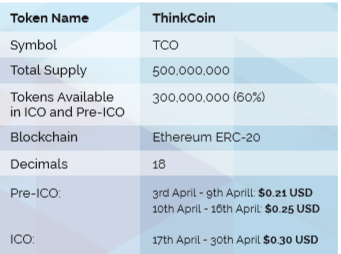 Details can be found on at ThinkCoin.io. We anticipate the ICO to be a huge success and raise a much larger sum than our minimum raise, or soft cap. To develop the initial version of the TradeConnect network we are targeting a soft cap of $5,000,000 USD through the Pre ICO and ICO. If we are unable to raise this sum, the funds committed by participants will be returned. A more significant raise will enable us to develop the network further, increasing its capacity and speed, with more products and participants. • ICO: 17th April - 30th April 2018.